Volvo and Polestar release new S60 TTA touring cars - Volvo may not be the first name you'd think of in racing, but it stands as a dominant force in European touring cars. Before stepping up to the World Touring Car Championship last year, Volvo and its partner Polestar Racing had come to dominate the Swedish Touring Car Championship. While that series has since expanded to all of Scandinavia, Volvo made other plans in switching over to the TTA Racing Elite League. And this is the car with which it will be contesting the new series. 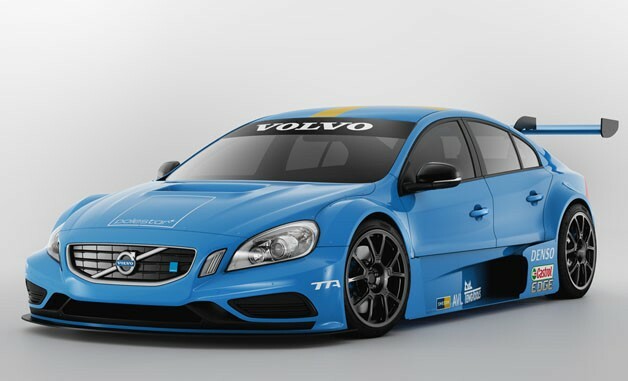 Rather than field the same C30 touring car which Volvo and Polestar had fielded in the STCC and WTCC, the TTA racer revealed here is based (or at least looks like) the S60 sedan. Under that carbon fiber body sits a 420-horsepower V6 driving the rear wheels through a six-speed sequential gearbox and boosted by a similar KERS regenerative braking system as employed in Formula One. The livery has yet to be finalized, so for now Polestar has decked the S60 TTA out in the same shade of baby blue that makes its other touring cars, that 450-horsepower all-wheel-drive C30 prototype and for that matter the Alonso-era Renault F1 cars so perplexingly devious. Click the image above to view in high resolution and follow the jump for the full press release.